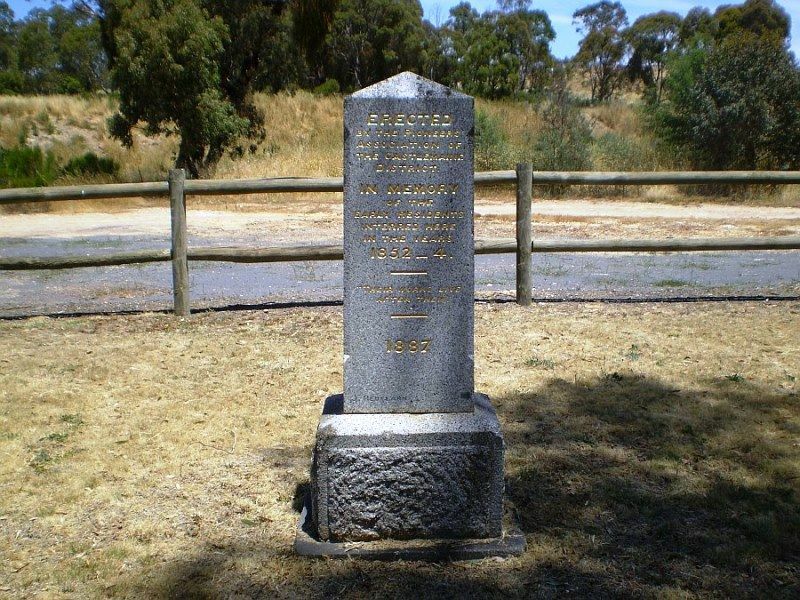 A monument commemorates the early residents who were interred in the Diamond Gully cemetery between 1852 -1854. 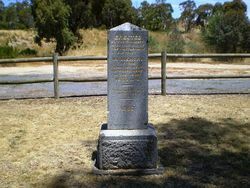 The monument is located in the old Diamond Gully Cemetery . Access via a small opening with a sign “Pioneers Cemetery Memorial. " Thursday Evening. The seventh anniversary of the Pioneers and Old Residents' Association was celebrated yesterday. In the afternoon the president, Mr. Elliott, unveiled a memorial stone at the Diamond Gully Cemetery, erected by the association in honour of the memory of the earlier residents who had there found a last resting-place. 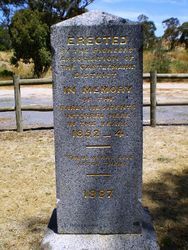 The tablet is of highly polished granite, and bears the following inscription :- " Erected by the Pioneers' Association of the Caatlemaine district in memory of the early residents interred here in years 1852- 4. Their works live after them. " In the evening a banquet was held at the Mechanics' Hall, Mr. Elliott presiding. The only Parliamentary representative present was Mr. J. B Patterson, who delivered an address pertinent to the occasion, and without political import. Apologies were received from Messrs. Fitzgerald aud Zeal, M L C's, and Mr. Gordon, M.L.A , and the mayor. Councillor Halford. The proceedings, which were of an enjoyable nature, were interspersed with excellent vocal selections by ladies and gentlemen, and did not terminate till an advanced hour. Argus (Melbourne), 30 September 1887. In The Years 1852 - 4.